I logged onto Flickr to check out the activity and photos posted by my friends and contacts. I noticed Cody Kapcsos had posted a photo of what appeared to be an old kit house. Now, having lived in the area for a few years in the early 90s I was fairly familiar with the area. 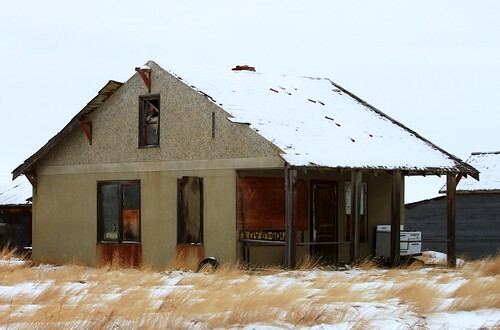 Retlaw was my first ghost town and I actually worked for the Alberta Wheat Pool in Enchant one summer. I had no idea where the ‘W’ town had gone. The article Cody linked to mentioned the ‘W’ was “Wheat Centre”. I had never heard of such a place. I’ve spent more than my share of hours looking over maps and had never seen it show up. As I mentioned to Cody in my reply to his photo, I was sure it was possible to deduce the location based upon the path of the railway and the pretty standard distance between whistle stops. I figured I would save myself some effort and ask Cody if he knew where Wheat Centre was. Cody figured Wheat Centre was right about where the townsite of Pageant showed up on the map. Made perfect sense to me. I returned to my topo map and followed the railway and, sure enough, there is Pageant marked right where one woud expect Wheat Centre to be. Since I was planning on going to Medicine Hat this weekend anyway I decided to plot a detour down through Pageant, Armada, Lomond, Travers, Enchant and Retlaw. Hey, for a ghost towner that’s practically “right on the way” and hardly counts as a side trip. I follow RETROactive, which is a Government of Alberta blog which focuses on Alberta’s Historical Places. The very next day after having this discussion with Cody about Wheat Centre / Pageant a blog post appeared in which Ronald Kelland introduced himself as “the names guy”. Not just any names, but THE names guy — Coordinator of the Geographical Names Program which means not only does he evaluate proposed new names for Alberta’s geographical features, but he also researches the origin and meaning of Alberta’s place names. This is just the guy I want to talk to! I responded to his blog post and asked about the history behind the renaming of Wheat Centre to Pageant. I thought it might make an interesting footnote as I made the drive through the area. Ron’s response was both quick and informative. Turns out Wheat Center (the government records have it spelled this way) was not the ‘W’ station along the Retlaw line. The ‘W’ was actually supposed to be either Walter or Waldeck but the station was never built. He also corrected a misconception I had held for years that Retlaw was named for an early postmaster in the area. While I was correct that “Retlaw” came from “Walter” spelled backwards, Walter Reginald Baker was not a postmaster but rather the Secretary of the CPR. And, Pageant, the town that seems to fit perfectly on the map where we expected Wheat Center to be? Not much is known about it — neither the date of its establishment nor the origin of the name are recorded. You can read all of Ron’s reply to me at this link. What a great resource! This weekend I plan on doing a photography trip following the Retlaw line as I take a “minor” detour on the way to Medicine Hat. I don’t expect to find much, but if nothing else it will be a good excuse to visit Retlaw again. As my first ever ghost town it holds a special place in my heart.